Unroll pie crust in ungreased 9-inch pie plate; press firmly against side and bottom. Fold over excess dough along edges, and pinch to seal; flute edges or press down with fork. Place sheet of cooking parchment paper on top of pie crust; fill with dried beans or pie weights. Bake crust 5 minutes, then remove parchment paper and beans. Bake another 2 to 3 minutes or until crust is just set and golden brown. Set aside to cool slightly. Reduce oven temperature to 350° F.
Meanwhile, in large bowl, stir granulated sugar, cornmeal, flour, salt, melted butter, milk, vinegar and vanilla until well combined. In small bowl, beat eggs slightly, then add to sugar mixture; stir until well combined. Pour filling into pie crust. Bake 50 to 60 minutes or until filling is set and top of pie is deep golden brown. If crust edges brown too quickly during baking, cover edges with foil. Cool pie about 1 hour or until completely cooled on cooling rack before cutting. Sprinkle with powdered sugar just before serving. Add a teaspoon of grated orange or lemon peel to pie filling, or swap whole milk for buttermilk for a unique flavor variation. Pie can be served at room temperature or chilled. Chess pie is a cousin of custard pie. There are only a few key differences separating the two. 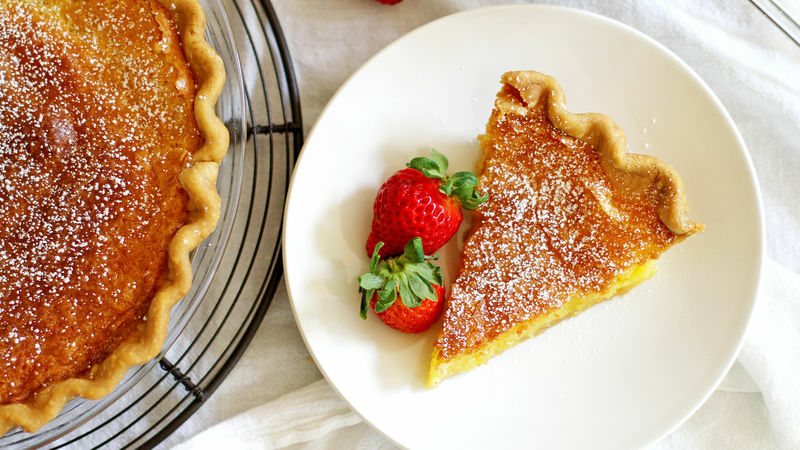 Chess pie generally has cornmeal in the custard filling, which helps the custard set quicker and adds a rich, yellow color. The other key factor that separates chess pie from custard pie is that chess pie includes more sugar. So much more sugar that when first developed, more than a century ago, the sugar worked as a preservative allowing this pie to be stored in a kitchen cabinet or chest — thus the name chess pie was born. While we don’t recommend storing this pie in a cabinet, we do recommend serving yourself and everyone else a healthy slice of this decadent Southern pie. And if your sweet tooth persists, check out the rest of Betty’s pie recipes. Feeling like you want to make your pie extra special? Why not make your own crust? Betty’s made it easy with this simple article all about how to make pie crust.